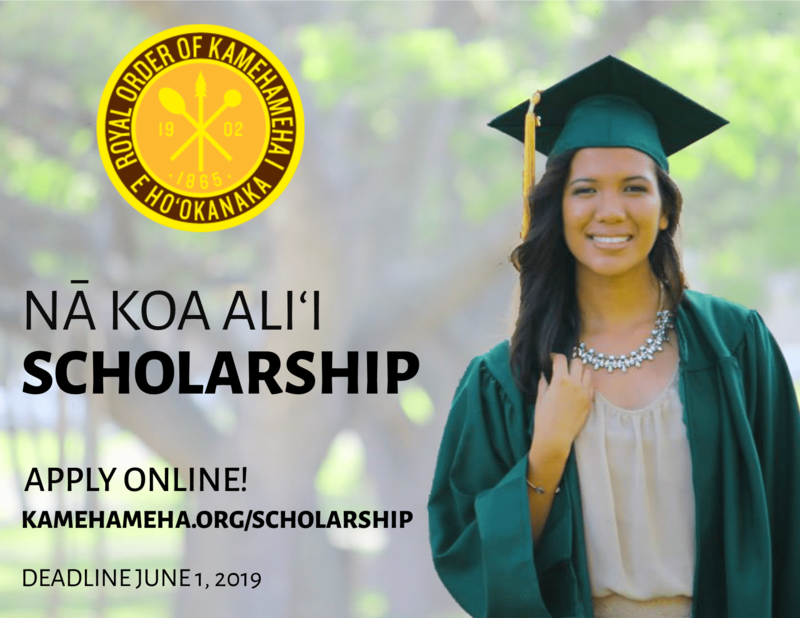 The Nā Koa Aliʻi Scholarship is made possible by the generous contributions of the Regina Kawananakoa Trust, Native Hawaiian Veterans LLC, Kinaʻole Foundation, and members of the Royal Order of Kamehameha I. King Kamehameha V created the Royal Order of Kamehameha I in 1864 to honor the memory of his grandfather, Kamehameha I. During the turbulent period of the illegal overthrow of the Hawaiian monarchy, the Royal Order of Kamehameha I went underground and was dormant until Prince Jonah Kūhiō Kalanianaʻole re-activated the Royal Order of Kamehameha I in 1902. The purpose of the Royal Order of Kamehameha I as it is known today is to unite in fraternal and benevolent work, men of Hawaiian descent, of good moral character, of sound bodily health; to cultivate the cardinal principles of friendship, charity and benevolence; to aid widows and orphans; to improve the social and moral conditions of its members; to provide scholarship assistance; to preserve and perpetuate the ancient culture, customs, and traditions of Hawai’i, uplift the Hawaiian people; infuse the spirit of patriotism, loyalty, helpfulness and kindness among its members; advance the interest of its members in every rightful cause, and to encourage and develop leadership. Throughout its rich history, the Royal Order of Kamehameha I has stood as a symbol of the chiefs of Hawaiʻi nei. Some of the most prominent citizens of the Hawaiʻi have been counted among its members. Applicants are required to submit a completed online application. To access the online application, you are required to sign-in using a Google account. Incomplete online applications will not be considered by the scholarship committee. Please carefully complete the personal information and academic information (name, date of birth, etc.). Be sure your information is accurate for notification and verification purposes. Applicants are encouraged to type essay responses using a word processing program with attention to the 500-word limit per essay. Essay responses should then be pasted into the online application for submission. Essays may be submitted in ʻŌlelo Hawaiʻi or English with attention to proper grammar, spelling, and punctuation. Be sure to review your online application before submission; online applications cannot be modified after the online application has been submitted.